otherwise known as children-remember-your-mom day, a wholly artificial slow-down in the whirl so cinnamon-raisin crumbs can be hansel-and-greteled between the bedsheets, violets can suffer strangulation, and mothers can get bleary-eyed at being remembered. or not. sometimes, though, the day affords much more. it allows us to dig down to where our memories lie, and pull a few good ones out by the roots. that’s the notion at the heart of a breathtaking essay written by a friend i met a few weeks back. my friend is laura lynn brown, and before i met her at a crowded noisy dinner table, i’d read her essay, the one the iowa review printed in its esteemed pages, and the one slated to run on slate, the uber cool website, today. her essay, “fifty things about my mother,” started out as an experiment in crafting pure-gold sentences, one at a time, in no particular order. laura, then and now a daily newspaper editor in little rock, arkansas, was getting close to 50, the age at which her mama had died, and she found herself aswirl in rememberings. around that very time, twitter, that 140-character writer’s challenge, was gliding onto the horizon. rather than scoff at such syllabary confines, laura was intrigued by the notion of power-packing a sentence. you’ll read, as you scroll through her sentences, how magnificently she mastered that challenge. and why no less than susan orlean picked the whole lot of them to win the 2013 iowa review nonfiction award. 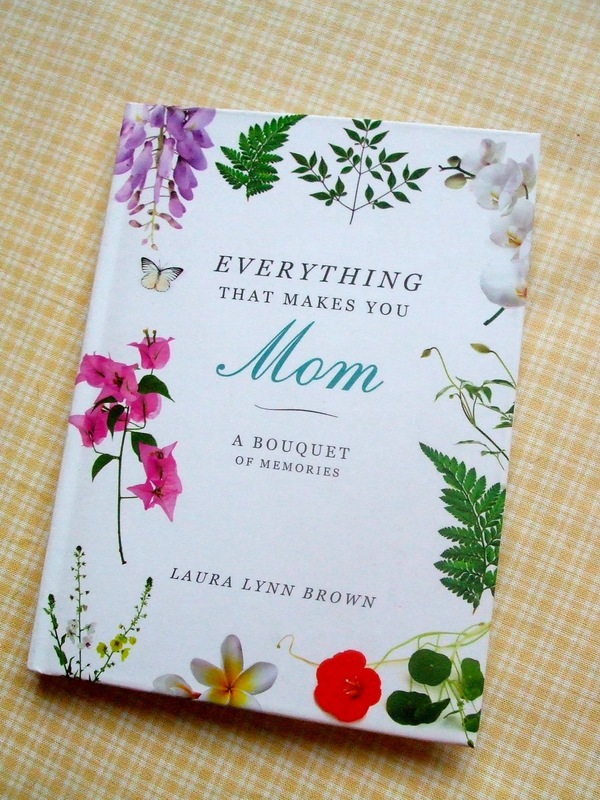 what happened next was that laura’s essay caught an editor’s eye, and, lo and behold, a book was born, everything that makes you mom: a bouquet of memories. only five of the original 50 sentences are tucked in the book, and rather than making it a book in which you’d read only laura’s memories of laura’s heavenly-sounding mom, she’s made it a book that tickles the reader’s heart and uproots some of your own most delicious mama memories. here at the chair, i’ve written over the years what amount to thank-you notes to my mama. the original mother nature is one, and so is grammy tuesday. 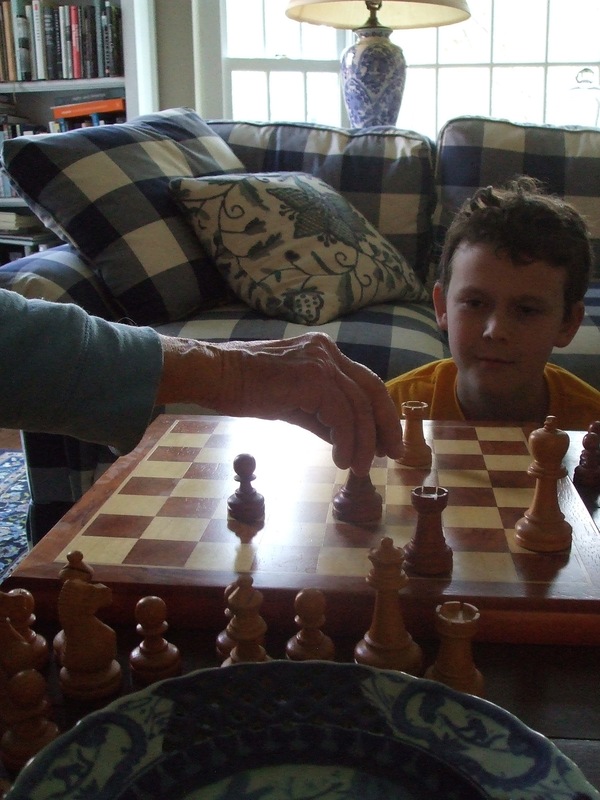 but borrowing from my writerly friend laura, i’ll take a crack at crafting a few thank-you sentences to my very own mama, who, at 83.5 and ticking strong, still parks her sleek silver SUV at the curb of our old house every tuesday, ambles up the walk with her blue-plastic cooler of whatever groceries she needs to cook and lay on the table one of her ever-revolving repertoire of the dinners i grew up with: chicken rice grammy, 3-4-5 stew, meatloaf crusted with catsup, and bags and bags of frozen carrots and peas. for tucking me by your side on the hardwood stairs the summer’s afternoon the hive of yellow jackets shimmied up my skinny little legs, trapped inside my jeans, and stung me mercilessly straight up to my bum. for making like julie andrews and singing into my ear, “when the dog bites, when the bee stings, when i’m feeling sad, i simply remember my favorite things, and then i don’t feel so bad,” the tune from “the sound of music” that still clicks on auto-play when i find myself inside-out, upside-down or just plain afraid. for the image of you in the rainy cemetery i’ll never forget: you with your sturdy sole to the cusp of the garden shovel, slicing into the oozy earth, at the mound of your beloved’s — my papa’s — grave — right above his heart, you whispered to me — digging the hole for the mahogany jewelry box that held our stringbean-sized baby girl, the one stillborn in the hollow of night, the one you helped us lay to rest, tucked snug against her grandpa’s stilled heart “where they’ll both always be safe,” you promised me. for the 1,048 grammy tuesdays since boy 1 was born, and the 572 grammy thursdays you tacked on once boy 2 arrived. for forging connections to those two boys that are at the bedrock of who they are and always will be. for knowing the instant you met my “old shoe” of a newsroom friend, the one with the holes in his penny loafers and the hanging-down hem on his seersucker shorts, that despite the fact that i was a lifelong catholic and he was a devoted jew, i’d met my soul’s desire. an abbreviated list of what you taught me: love like there’s no tomorrow; don’t ever stop; poetry is prayer; 101 things to do with frozen peas; and if you want julie andrews, plop her on the record player. for all of this, and so very much more, dear mama, thank you and thank you and happy blessed mama’s day. please come for 3-4-5 stew, washed down with slippery buttery baby frozen peas. what would you write in your thank you note to your mama? 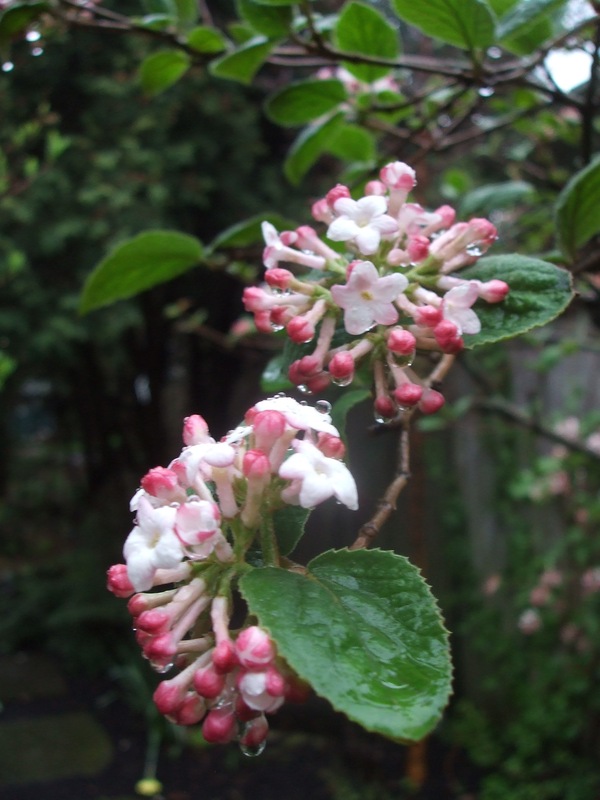 korean spice viburnum, blooming just this morning outside my kitchen door, a bouquet for my mama..
and for all my beautiful friends whose mamas are no longer here, a bundle of extra deep hugs. it’s a bottomless loss, stirred all the more painfully on this day when it seems everyone else is bathing in the very thing that brings you heartache. oh, dear jane, i have a deep inkling of how achingly hard this day can be (i get my turn at father’s day). laura lost her mom too, and she never got to give her mama her list of 50 things. the older we get, the more heartache we are filled with. sending a big big hug. p.s. just so you all know: that’s my mama (the barbara mahany above). in other matters of confusion, she named me after herself. her real name is mary barbara, but she only likes her middle name so she gave it to me, and thus she differentiates herself by calling herself, “barbara the wiser,” leaving me to assume i am “barbara the less wise.” hmmm. both brownings, dickinson, wordsworth, frost, i knew them before i think i knew how to read. all five of my mama’s babies knew tanagers from indigo buntings too. and in the springtime when the woods erupted, we knew the trillium from the dog-tooth violets, knew never ever to touch the ones that were marked “endangered species.” i used to bemoan the fact that unlike many of my friends’ mamas, mine almost never took me to lunch or shopping. funny how now those are the last two things i’d ever want to do. and i could spend forever in the woods, watching birds, unspooling poetry. funny how we become parts of our mothers. you are so so lovely to come pull up a chair. chair folk, do meander over to amy’s beautiful blog, mypathwithstarsbestrewn.com/ how lovely a name for a place to curl up with poetry and pictures…. Oh yes, the poets! Just reading their names listed here is a transport of delight. At Momma’s knee, I learned to love music, language, wildflowers, all creatures great and small, was taught the quiet joys of embroidery. I, too, am a child of the woods. I inherited so much of what I love from my momma. I’ve got a jazz gene from my daddy, which I think balances me out nicely. I do love to wax poetic, but I’m just as likely to belt out every line to “Chatanooga Choo Choo” in unison with my dad! Touching, inspiring, awe-ing, and a great reminder to us all to take time and reflect on mother!! Thank you for writing this – I just had to “share” it all over the place!!! bless your heart, dear louise. what i love about the 50 things — one of the things i love about it — is that even for those without their mamas nearby anymore, the conjuring up of the sentences, the digging deep into the interstices of who we are, and all the moments that have moved us to here, it’s a way of wrapping ourselves in the holy shawl of comforts remembered. it’s the power of the imagination to transport us to the arms that once held us and rocked us…..
a bit of the beautiful for this morning of mamas…happy blessed. Reprinted from Sleeping Preacher, University of Pittsburgh Press, 1992, by permission of the publisher. First printed in West Branch, Vol. 30, 1992. Copyright © 1992 by Julia Kasdorf. I love this post, and all the ensuing conversation. Thank you for singlehandedly writing this. My favorite thing here: that she comes and cooks for you once a week. but your words are not life itself. You cannot speak to them of Divinity itself. arrayed before them every moment. the visible will reveal the invisible to them. and learn to experience joy. you will open the gate of understanding. Go for a slow and mindful walk. Show them every little thing that catches your eye. Notice every little thing that catches theirs. Don’t look for great lessons or seek to teach great things. The lesson will teach itself.